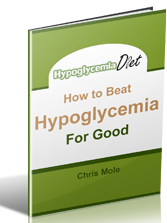 Some experts believe up to 20 percent of adults in the western world suffer from hypoglycemia. This is easy to believe when you consider the incredible amounts of sugar and refined carbohydrates that people eat and drink today. And with the diets of today’s children being even worse than their parents’ we’re heading for an even worse situation with hypoglycemia in future. I don’t intend to get into a detailed medical explanation of hypoglycemia because it is complicated and somewhat controversial. However, in simple terms, hypoglycemia means rapid rises and falls in the level of glucose in the blood. This is due to a malfunctioning of the pancreas and liver, predominantly. Exhaustion of the adrenal glands is also a factor. In a healthy person, the pancreas produces just enough insulin to neutralise any sugar eaten, to bring the blood sugar back to normal. But in people who have hypoglycemia, the pancreas overreacts and produces too much insulin in response to the sugar eaten. This over-abundance of insulin metabolises not only the sugar which has been eaten but also some of the glucose which was already present in the bloodstream. The result is a state of low blood sugar which can cause an alarming number of distressing symptoms. These include headaches, dizziness and feeling faint, irritability, depression, difficulty in remembering, blurred vision and in most cases an overwhelming craving for something sweet or a stimulant such as tea or coffee. If any of those symptoms sound familiar, particularly if they are accompanied by a craving for sweet food, then it is very likely you are suffering from hypoglycemia. In addition, strenuous exercise also lowers the blood sugar. This means if you have hypoglycaemia, you should be careful not to over-do any physical activity. After heavy physical work, a healthy person feels tired, his energy has been drained. However, if he rests, his strength will return reasonably quickly. Basically, what happens with exercise is that it burns up part of the glucose in the blood. Stored glycogen in the liver is then used to bring the blood sugar level back to normal – even if the person doesn’t eat anything immediately. The adrenal glands help raise the blood sugar level by releasing catecholamines which convert glycogen into blood sugar. Thus, the healthy body has a system of checks and balances, involving mainly the liver, pancreas and adrenal glands, to ensure the blood sugar level stays stable. But in a person suffering from hypoglycaemia, the system doesn’t work properly. After strenuous exercise, the person’s blood glucose is depleted and the adrenal glands react by releasing catecholamines to convert stored glycogen into glucose. But unlike the process in a healthy person, in the hypoglycemic the new glucose stimulates the pancreas to produce more insulin – which once again lowers the blood sugar level. The pancreas of a hypoglycemic person is extremely sensitive to extra glucose, whatever the source. It over-reacts to glucose with a secretion of insulin too large to maintain an equilibrium in the body – and the person suffers the symptoms of hypoglycemia. The cure for hypoglycemia is to prevent large swings in the blood sugar level, by eating little or no sugar and by avoiding excessive physical exercise. But it is much more difficult than it sounds. Sugar is found in so many foods these days, particularly packaged foods, which almost always have sugar added. Some people are also sensitive to “natural” sugars such-as those in fruit and even milk. 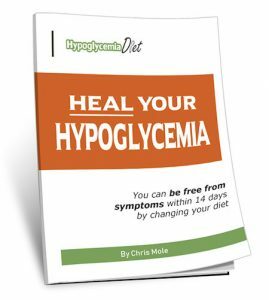 Learn more about hypoglycemia … and the best diet to eat … in my free report. You can get it now by completing the form at the top right of the page.